I love Peppermint and I use it on all my computers, except my new DELL laptop. This is just because I can't install on my laptop. This is a laptop from work and it has been bought with Linux (Ubuntu 16.04) pre-installed. I would prefer to have Peppermint on it. I tried to install both Peppermint 8 and the more recent respin. I always run in the same problem. I create a bootable USB stick from the Peppermint ISO image. I tried both unetbootin and USB image writer. It boots properly on my other computers. On my Latitude it seems to boot but after about 10% of the "Starting Peppermint" screen I get a black screen and two seconds later I see the Ubuntu 16.04 desktop. Very frustrating. This happens with "Try Peppermint" and also with "Install Peppermint". Tried both UEFI and Legacy boot. I have succesfully installed Linux Mint and Archmerge on the same laptop and can boot any other USB with other distros without any problem. What is it that you PepperMint friends are doing so special in your boot sequence?? I saw a similar problem with a DELL XPS 13 on the forum and there the problem was solved by a "Wipe all internal memory" in the DELL BIOS. I am afraid to do this as this laptop is from my work and they might one day want to really recover the Linux onthere or something. Also I have already done a lot of work under Linux Mint which I don't want to loose. Just as a matter of interest, does a Peppermint 7 LiveUSB boot to a Live session ? I'm wondering if it's anything to do with our later version of Xorg, or something else. And do you know how to boot the LiveUSB without the "quiet splash" boot parameters, to try get a handle on where it's failing ? I also tried to boot with a Peppermint 7 USB stick (made with USB image writer) and the result is exactly the same. Oh yes... Will try quiet splash tomorrow, using 'E' to get options in boot menu. So anyone can pause it to see what happens. Please let me know if there is a smarter way to capture the messages scrolling during the boot process. then remove the tick from "ubuntu"
Will the Peppermint LiveUSB boot now ? If it does, DO NOT install Peppermint as it may overwrite the Ubuntu EFI bootloader .. I just want to know if the LiveUSB will boot if you select "Try Peppermint" ? Even when I remove everything except the USB stick from the Boot Sequence, the behavior is exactly the same. then use F12 to access the boot device selection screen and boot the LiveUSB in Legacy mode. Again if the LiveUSB boots, do not install Peppermint .. I just want to check if Peppermint boots .. I'm trying to discover if this is a problem with the the system misreading the UEFI boot files, or a problem with Peppermint and your hardware. Setting your BIOS back to UEFI will make Ubuntu bootable again. Very strange as other distros seem to boot fine from USB (tried Manjaro LXDE, ArchMerge, MINT, MX-17). Thanks for the ever fast answers! Still the same .. are you saying it booted Ubuntu, even when the BIOS was set to Legacy ? REMARK: When you see "ubuntu" below it actually points to linux MINT which I installed on my laptop (the MINT installer decided that for me. Maybe I should change that as it might be confusing.). The original DELL ubuntu is somewhere on my computer but I don't know where (recovery partition or so?). I never use it but I don't want to wipe everything in case my work one day wants to reset the laptop to original DELL ubuntu. /dev/nvme0n1p1: LABEL="ESP" UUID="68F7-A413" TYPE="vfat" PARTLABEL="EFI system partition" PARTUUID="12c94d90-9967-4c5b-893a-1f8ba368a5a5"
/dev/nvme0n1p2: LABEL="OS" UUID="3827-64A9" TYPE="vfat" PARTLABEL="Basic data partition" PARTUUID="cf074890-14c9-4025-95e7-cf60f9f7746e"
/dev/sda1: UUID="2017-03-21-16-57-06-00" LABEL="Peppermint Seven" TYPE="iso9660" PTUUID="65c75b10" PTTYPE="dos" PARTUUID="65c75b10-01"
/dev/sda2: SEC_TYPE="msdos" UUID="B1F5-0A13" TYPE="vfat" PARTUUID="65c75b10-02"
I also tried to install the Peppermint 8 respin 2 but with exactly the same problem. I'm having a very similar problem on my new Dell Latitude 3480 that came with an OEM install of Ubuntu 16.04. I've tried all the BIOS settings suggested on this thread, but I run into the same problems every time. When I choose the "try without installing option", I see the Peppermint starting up screen, then enter what seems to be a Ubuntu 16.04 live session, not a Peppermint one. There is no install option any where. 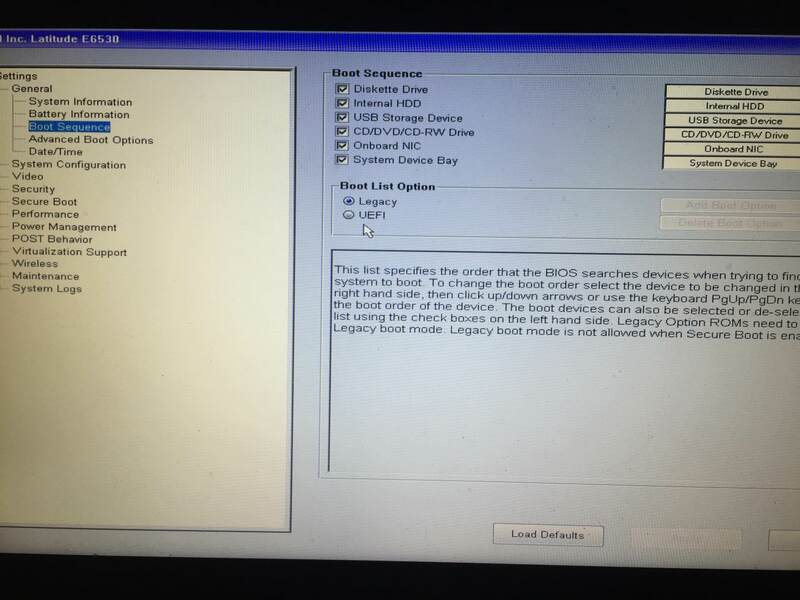 This Dell recovery medium can be used to restore the original factory software. It is recommended that you back up all important data before running this. Error: This recovery media only functions on Dell and Alienware systems purchased with Ubuntu. The standard "Back" and "Continue" buttons are greyed out, only the "Quit" button works. I successfully booted into to a Xubuntu live session on the same computer, and I only had to disable secure boot for it. Didn't need to enable Legacy or anything. On the other hand, I used the same Peppermint USB stick to enter a live session on another computer, so the bootable USB itself is working just fine. Like the OP, I'd really appreciate help figuring this out. This is to be my new main computer and I'd really like to install Peppermint on it; it's the OS I've become most comfortable using. Are you interested in retaining the Dell recovery partition ? No, though it would probably be prudent to have a copy on hand, if making one is possible? ii  dell-super-key                             0.04                                                all          Disables the super key by default. Someone on Ubuntu said uninstalling the dell-recovery package allowed them to boot an Ubuntu LiveUSB without ending up in recovery mode. But your best bet would probably be to either simply wipe your HDD completely, or to swap out the HDD for another. 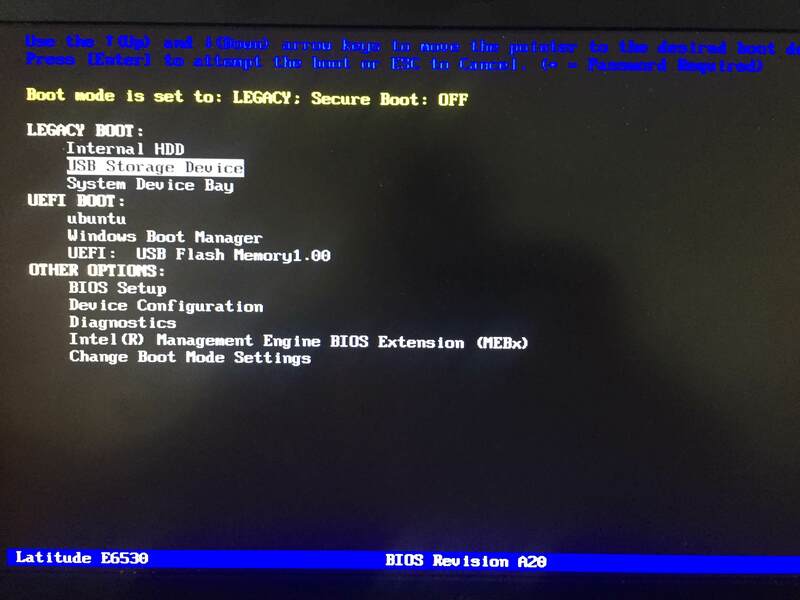 a) disabling UEFI in the BIOS (setting Legacy boot) .. apparently this allows you to boot a LiveUSB, but in legacy mode.